Former National Security Advisor Michael Flynn pleaded guilty Friday to making false statements to the FBI at a federal court in Washington, D.C. 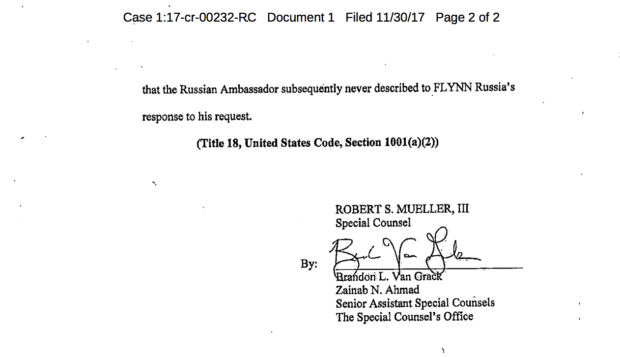 According to the two-page charging document, Flynn lied to FBI investigators about his communications with Russian Ambassador Sergey Kislyak during the transition. The conversations concerned sanctions levied against Russia for interference in the 2016 presidential election, and a U.N. Security Council resolution. The document makes no reference to other possible criminality, including his undisclosed work on behalf of Erdogan regime. Per the terms of a separate plea agreement, Flynn will receive a base offense level of six for purposes of the federal sentencing guidelines, meaning he faces zero to six months in prison and substantial fines. You can read the two-page charging document below. 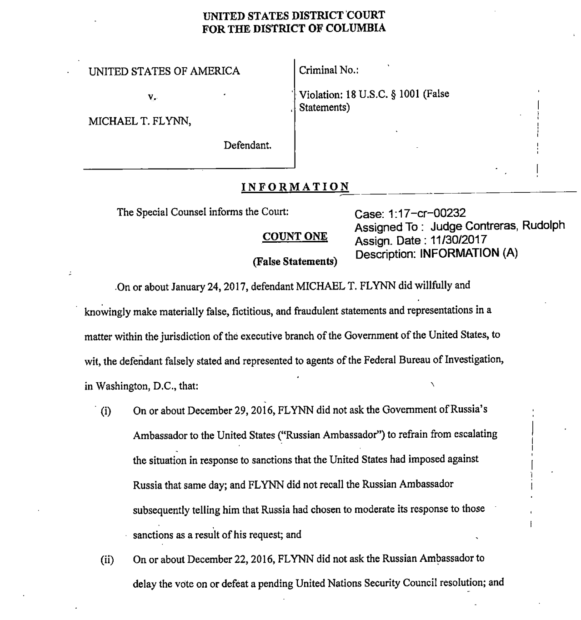 Flynn was charged via a criminal information as opposed to a grand jury indictment. An information is generally used when a defendant has waived their right to be charged by a grand jury, a strong sign the defendant is cooperating with prosecutors.